Harriet Carter Called Death For You! Happy Harriet Carter Wednesday! Just when you think the Harriet Carter Crapalog starts to run out of items, I discover more crap that can be sold. Good for Harriet. 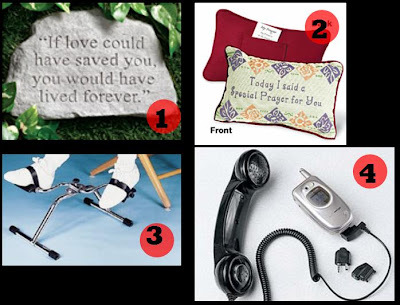 From exercise, to death, to the phone, Harriet Carter has you covered and if you have $10.00 to spare, you can afford all four of these items. Let’s go! Product # 1 – As we all know by now, Harriet Carter loves death. She loves it. Now you can buy your very own death stone for a loved one and let them know that there was a chance you could have saved them from dying, but you didn’t. The stone literally says, “If Love Could Have Saved You, You Would Have Lived Forever.” Huh? I don’t even know what that means. So could loved have saved the person or not? Yeah, tell that to your poor Nana that died. Nana didn’t need “love” to save her, she actually needed medial attention. She probably needed an ambulance, but you just let her stay on the ground as you tried to bring her back to life by “loving” her. Nice move. Nana’s dead because of you Harriet Carter. Oh, and Harriet? I love you. Product # 2 – If Harriet isn’t selling “death” she’s selling white-trash pillows with dumb sayings on them. This highly flammable pillow says, “Today I Said a Special Prayer For You.” Really? Why? If someone ever gave that to me I would be pissed. Actually, scratch that. I wouldn’t be pissed, I’d be suspicious. Why are you saying a special prayer for me? Am I dying? Did someone I know die? Am I sick? Did Harriet put you up to this? Why are you saying a “special” prayer for me? Is that code-word for “you’ll be sleeping with the fishes tonight?” And what the hell are those designs on the pillow? Is it worms, leaves, and the sun? Why? Why would I want to rest my head on that thing? Are you going to smother me with that pillow? Is that the special prayer? I’m scared Harriet, I’m scared! Product # 3 – Hey lazy! Are you too tired to go to the gym? Are you still looking for a high-impact workout? Well worry no more because now you can buy these “peddles” from Harriet Carter. Yes. Peddles. And thank God they have straps on them because clearly you’d going flying off that thing once you get going! Is the person in that pictures actually sitting on a directors chair as they peddle? And why is everything there blue? Wait, did this person peddle to the sky? I think that’s it. Seriously, what kind of workout are you doing with that thing? I think you’d get a better workout by hitting yourself in the face with this contraption. That’s actually what it is. A contraption. P.S – Nice Keds. Did you peddle all the way back to 1991? Thanks Harriet for keeping America fat. Product # 4 – Hi is ridiculous there? Oh really? Can I leave a message? Is this a joke? Why in the hell would you ever need to plug in your actual phone into your cell phone? That looks absolutely ridiculous. I’m totally getting one. I’d pay to see someone walking up the street with an actual phone receiver attached to their cell phone as they talk. Brilliant. It looks like it’s real convenient to store in your pocket when you’re not using it too. I mean, sure the phone receiver will stick out of your pocket a bit, but “crazy” has no boundaries. Well that concludes another weekly segment of “Happy Harriet Carter Wednesday.” Go with God.